Bolle shades are known for their bold, sporty designs! 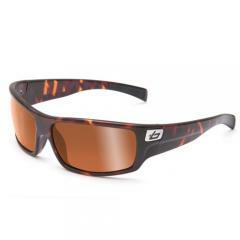 The 11367 Tetra Dark Tortoise Polarized Gold Sunglasses feature durable polycarbonate lenses in a vibrant polarized gold that guarantees full UV protection for eyes. The Bolle frames are crafted from lightweight acetate, providing a full rim and a wrap-around medium sized fit. The dark tortoise-patterned hue serves as a subtle compliment to the bold, modern lens. The Tetra sunglasses comes with their own carry case and lens cloth to keep eyewear protected when not in use and looking like new.